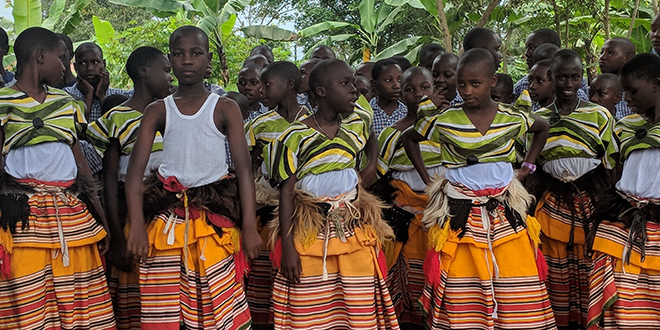 Traditional welcome: Children from St Joseph’s, Masaka, in traditional dress welcoming visitors from Australia. VULNERABLE children in Uganda are benefitting from Queenslanders’ discarded drink bottles and cans. Money raised through recycling the bottles and cans is being directed to the children through a Brisbane Catholic couple’s charity Uganda Kids. Sue and Paul Fyfe have registered their charity with Queensland’s new Containers for Change recycling scheme, and the benefits have started to flow. The Petrie parishioners registered Uganda Kids with Containers for Change in November, and the charity’s received $500. “People at Petrie parish have already started collecting bottles and cans,” Mr Fyfe said. He said Uganda Kids had been assisting children in Masaka, in the Central Region of Uganda, since 2010. “We say the children we help are ‘vulnerable’ – they’re either orphaned or dead poor,” Mr Fyfe said. “We have been assisting kids since 2010 and at the moment our donors are making it possible to help more than 350 kids attend school. So Mr Fyfe said any money raised through Containers for Change was worth the effort. Anyone wanting to support Uganda Kids through depositing bottles and cans with Containers for Change needs only quote the charity’s identification number for the scheme – C10053904 – when making deposits.